PLANTATION GRILL AT DOUBLE SIX LUXURY HOTEL SEMINYAK - Walked into the 20’s ambience of Robert Marchetti Plantation Grill at the 4th floor of Double-Six Luxury Seminyak was definitely glam and grande, reminds me to one of the highest bars in Singapore. With less light, blues music, a sound of glass, typically high-end restaurant (I mean, it is the right time for you to well dressed and enjoy everything), but I think it was not the point. Remember they carried the “Grill” word made me curious, would I get the best grilled meat that night? 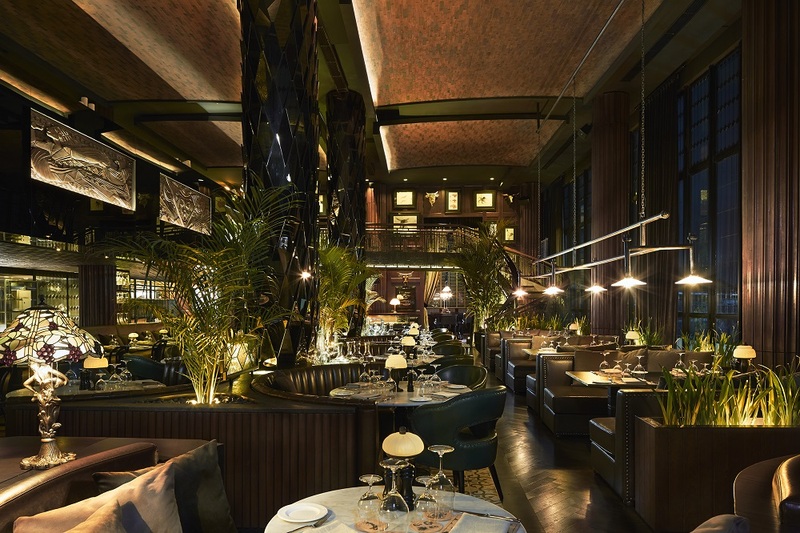 I can say that the concept of the restaurant completely fabs, old school style leather sofa, the richness of the dark colors of its interior, go up one floor you will see its Bar, private room that so “Mouline Rouge”, also with the restroom, they are all perfect without question. Now how about the food? It was a kind interesting experience for me that the night was full of surprises. Start from the appetizer that had prepared at our own table, Chevice Meets Tartare from Raw Grouper, Wild Barramundi, Salmon mixed with Fresh Fennel, Mint, Caviar served with Garlic & Herbs Butter Toast in one bowl of fresh raw dish enjoyed with sliced crispy bread was totally good and mouth watering even when the guy started the mixture. We also ordered a side dish that have inspired me to order it again on the next breakfast at Double-Six Luxury Hotel Seminyak was a full of fresh Wild and Cultivated Mushrooms with Soft Herbs which was unbelievable crisp and juice at the same time, although I knew that what makes them so good was the herbs (which is I believe it’s secret), and there was some Pan Fried Crab Cakes served with Avocado, Lemon & Lime Aioli, Palm Heart, Wild Green Chervil & Chilli. But top of the top is my main dish, of course, The Plantation Minute Steak: Thin Cut Grain Fed Black Angus Rib Eye, 180g, served with Wild Green Salad, Anchovy & Garlic Lemon Butter – Cooked no less than Pink, which was mean it’s quick grilled, I think it will be medium rare because its thinness, but let the chef do his work, and voila, this is the BEST steak that I ever eat so far, totally my style, very simple, effortless and so essential, mouth watering till the last cut. No question about the interior also with the meat served at Robert Marchetti The Plantation Grill. Whatever it is, they got the technique of its storing meat, which kind of meat that best for each menu, and all the qualities along with high flying hours in the business. More surprise has come from its dessert, THEY HAD BURNED my dessert? New Old School Bombe Alaska, Crème Whisky Caramel and Sorbet (I don’t do too much alcohol so honestly I had no idea what that actually was). So if I can reconstruct the desserts, it will be a chocolate ball with liquor inside, covered with sour sorbet, covered with decorated caramel whipped cream that will be burned along with flowing whiskey, a Very nice closing trick to then go up to the sling bar to spend the rest of the night. Then I picked the unsuspicious soft pink chocolate ball, and it is, just a chocolate. Such a cool place! Thanks for sharing!